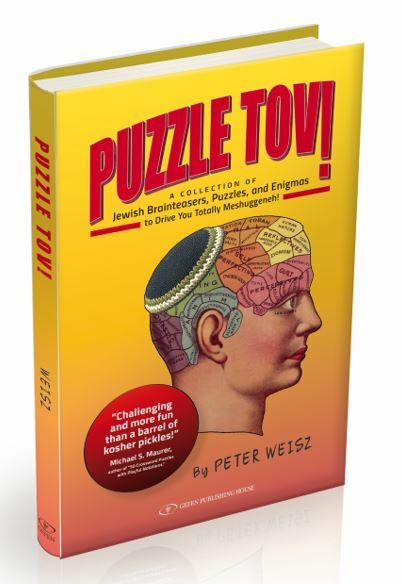 A Kosher Collection of Jewish brainteasers, puzzles, and enigmas to drive you totally Mesghugenneh! EDISON, N.J. - July 23, 2017 - PRLog -- Challenging riddles, enigmas, logic problems and mind-benders, all with a Jewish twist. Jews have always been a puzzling people. In both senses of the word. We have certainly caused consternation and bewilderment over the ages (just contemplate the mysteries of gefilte fish, for example). And we have, by and large, always enjoyed a good intellectual mind-bender. You don't have to be Jewish to enjoy this book! Peter Weisz is a publisher and author of more than a dozen personal biographies. His most recent titles are "Yearning to Breathe Free" (Gefen Publishing) and "I'm Still Smiling!" (Bold Dog Books). Peter has been creating and collecting puzzles since childhood. His work has appeared in The New York Times, GAMES Magazine, NPR's Sunday Puzzle, and numerous other venues. Peter lives in West Palm Beach, Florida with his wife, Alla, and two of his six children.